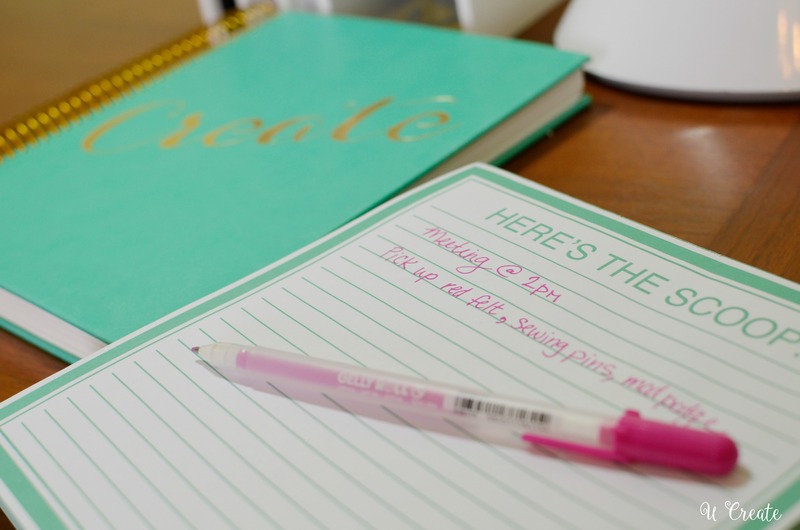 Every January “organization” is on the brain. I don’t know why I’m not as motivated at other times of the year to organize my life, but with the brand new year here it does something to me and gets me in that get-my-life-in-order kind of mood! I recently swapped my craft room with my daughter’s room and so that pretty much means I’m starting over and trying to find a new place for everything. 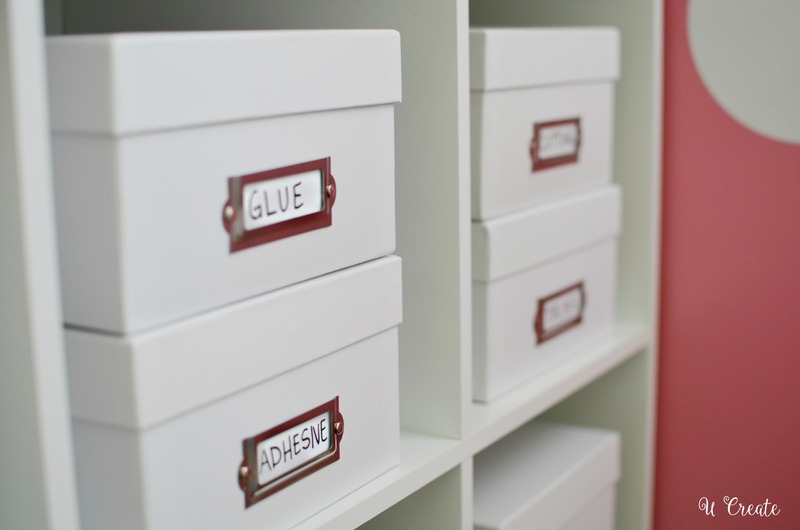 Let’s start with my very favorite organizition idea…ever. When I saw this little, white craft caddy at Michaels I FELL IN LOVE. I knew exactly what to do with it. 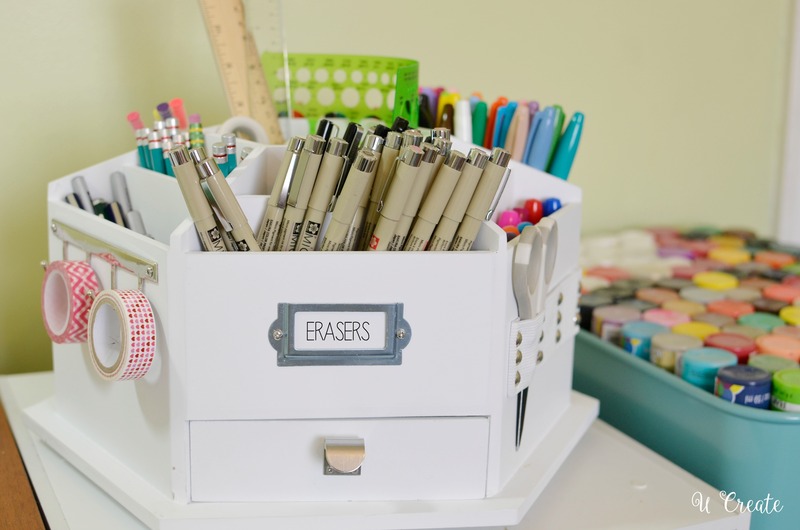 It has 4 little drawers for smaller items like erasers, clips, etc. Tons of compartments for writing utensils, and a large center for big items like rulers, scissors, etc. Now instead of my items shoved in a drawer, I can see exactly what I have and it’s inspired me to sketch even more! Now, my full craft room isn’t quite finished but here is one section where I keep my sewing machine, cutting machine, and iron. I use colorful baskets to store bulky items like embroidery hoops, yarn, felt, and other large items. sewing machine tools – you name it! I love the loo of the white because they match my craft bins. You can also find them in all sorts of designs by holiday, color, trend,…oh, they have kraft colored and chalkboard ones, too! I ALWAYS keep a little notebook on my craft desk. I write down things I need to buy if I’m running low on a craft item, inspiration, or anything I need to remember! Over the years, I’ve collected many patterns and craft magazines! 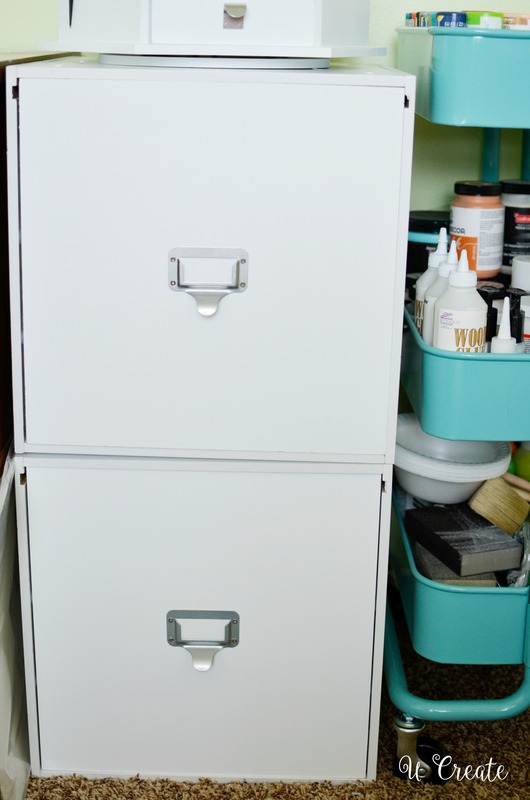 Grab a filing cabinet or two and they store perfectly inside! 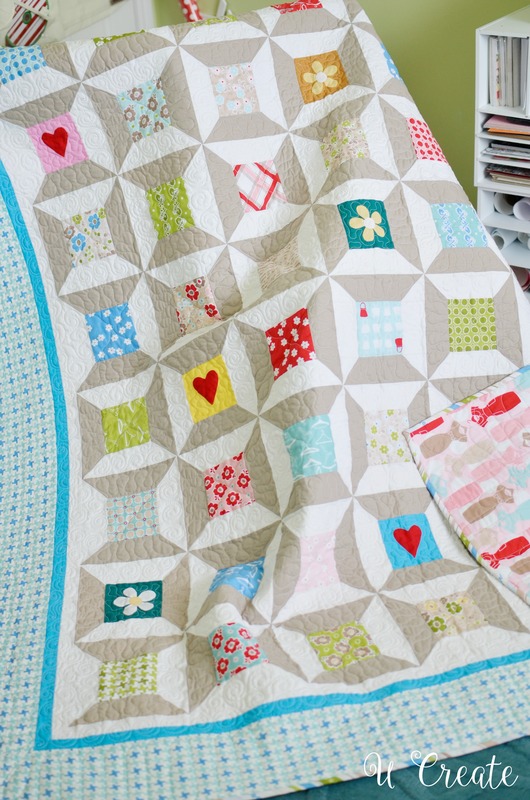 You can label them by craft and know exactly where your patterns are when you need them. Lastly, I want to show you what I’ll be hanging on one of my walls. I am SO THRILLED about this. My amazingly, talented mother surprised me Christmas morning with this GORGEOUS spool quilt she made. I cried. I was so shocked because I know how many hours she worked on this. This is one of those things you receive and think that if your house is ever on fire your going straight to it (well, maybe after the kids)! I will cherish it forever and it will be my favorite craft room decor! Looks great! And Mom’s quilt is beautiful! 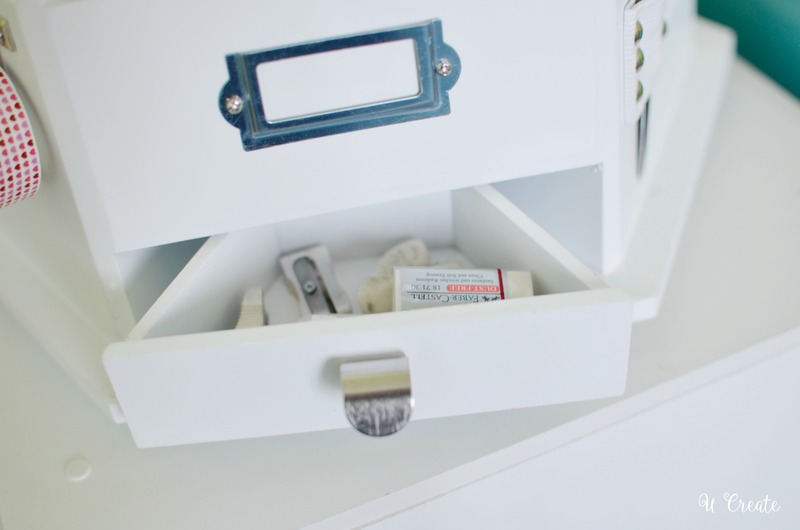 Can you suggest where I might get file drawers like yours? My daughter just mentioned that she needs something like that, individual drawers that stack but I haven’t any idea where to look! Thanks for sharing your ideas with us! I like the idea of the photo boxes from Michael’s acting as storage – I’m going to have to watch for another one of their 6 for $10 sales!!! Hi~ I love your quilt. Would you be able to share the pattern? Hi there! 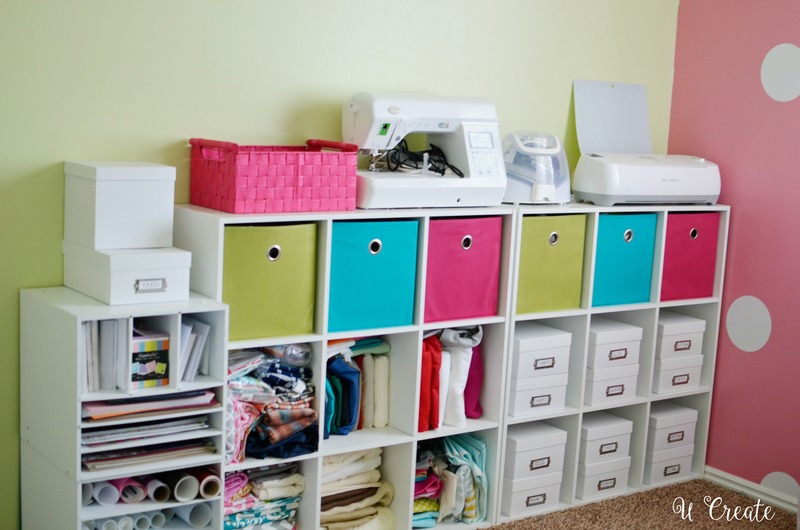 Is there an updated post on your craft room? I’d love to see it! Actually I have moved my craft room upstairs and I’m in the works of remodeling it. 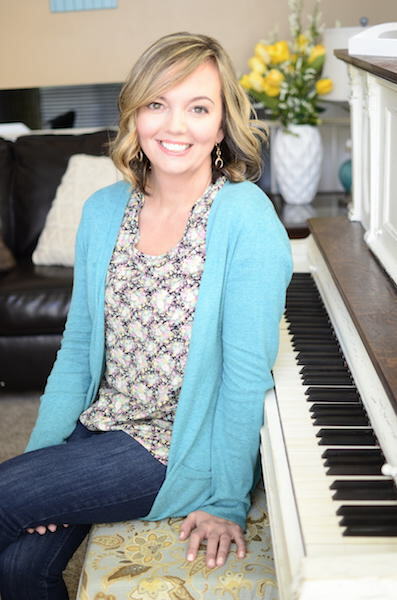 I will definitely post an update next month – thanks for asking Brooke!